Herbs, with their antiviral, antibacterial, and antibiotic properties have been included in healing regimens for thousands of years because they strengthen the immune system, whereas chemotherapies, though they can suppress certain cancers, can have a deleterious effect on the rest of the body. Why one cannot often find an herbal or other alternative treatments for cancer working with one’s MD is an engaging question. The explanations can be multiple, but at least one reason stands out: He or she either has not learned about these options or is prohibited from using them in the context of their practices. Current laws and medical association conventions keep many in the medical profession within somewhat limited practices. In the US today, where health costs top $1 trillion, where expenditures are greater than in any other country and yet where the nation ranks 16th in life expectancy, one can find many alternatives to conventional drug and surgical treatments. Orthodox cancer treatments can start at $8,000 and rise to $20,000 or more for a short treatment span. Side effects of chemotherapy and radiation are often devastating, and at autopsy many patients are found to have died not of their cancer, but of the treatment. 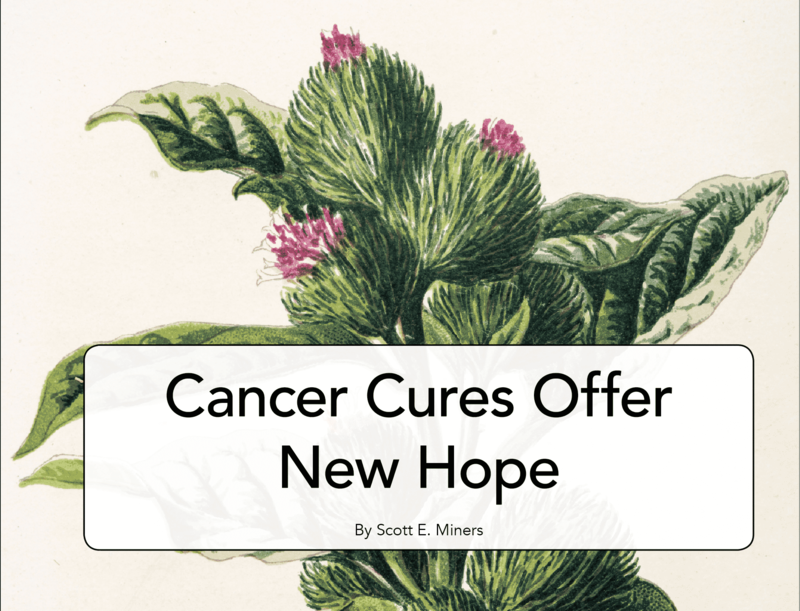 This article will look at a remarkable herbal remedy for treatment of cancer that traces its roots to Canada and a Native American medicine man. In 1922 nurse Rene Caisse worked in the surgery ward in an Ontario hospital where she found an elderly woman patient with a strangely scarred breast. The woman explained to nurse Caisse that thirty years earlier doctors told her she had advanced breast cancer and would need to have the breast removed. She declined the surgery. A Native American friend in Ontario had offered to heal it with herbal medicine, and she decided to accept. The man, an Ojibway herbalist, gave her the herbal recipe and showed her how to make a brew of it. She drank the tea daily. Her tumors shrank and then disappeared. She was still totally cancer free over thirty years later as she spoke with nurse Caisse in the Ontario hospital. Caisse obtained the recipe for herself thinking she could use it if she ever had cancer. It turned out that shortly afterward Caisse’s aunt was diagnosed with advanced stomach cancer and given six months to live. Caisse asked her aunt’s physician, RO Fisher, for permission to try the tea. He consented. Her aunt drank the herbal brew daily for over two months and recovered. She lived for twenty years more cancer free. Fisher and Caisse then began treating cancer patients whose physicians had diagnosed them as terminal, and many of them improved dramatically. Caisse and Fisher modified the combination of herbs, and Caisse named the concoction “Essiac,” which is her name spelled backward. Canadian officials, concerned about laws against practicing medicine without a license, and practicing physicians attempted to censor Caisse’s work. Caisse received numerous lucrative offers for the formula, but thought a large company would take it over, and that Essiac™ would then become less available to the people who needed it most. It came freely from the Earth in a healing spirit to a Native American medicine man who passed it on in grace. Shouldn’t all people have it that way? Caisse asked. Frederick Banting, MD, who discovered insulin, wanted to test the substance in his laboratory, because a person who had been cured of cancer by Essiac no longer needed insulin for her diabetes. Under Essiac™ therapy, though the cancer tumor of the bowel became larger and harder at first, the tumor soon softened, got smaller, and disappeared. The woman’s diabetes also ended. Banting thought the Essiac™ healed the pancreas as well, and thus had potential to treat diabetes. He wanted to test the substance in his lab, but he also wanted Caisse to close her clinic while he conducted tests. She refused, asserting there were too many people waiting for treatment. The tests on diabetes were never run. Essiac™, despite the strong evidence that it seems more effective than chemotherapy, radiation, and surgery in treating various cancers, is not a cure-all. Jim Chan, ND obtained Essiac from Resperin Corporation for cancer patients through the emergency drug release program and maintains that Essiac is “not 100 percent effective.” The individual’s personal life, the kind of carcinoma, and the time at which he or she starts taking Essiac™ can be factors. Still, Chan has had a high success rate with those who had the least amount of radiation or chemotherapy. Most had begun the Essiac™ regimen in late stages of their cancer illness. Essiac™ had a far better success rate than most chemotherapy. In 1978, nurse Caisse signed over the rights to her formula, just before she died at the age of 90, to the Resperin Corporation and Charles Brusch, MD, of Cambridge, Massachusetts. Brusch had worked with Caisse in treating patients and refining the herbal formula. He later cured himself of cancer of the lower bowel with the herbal treatments. Upon retirement he gave his clinically studied formula to Elaine Alexander of Vancouver, BC. Alexander soon after turned over rights to this formula to the Flora, Inc. company, an herbal and natural products family-held business long known for its quality and purity of food supplements. Flora named the Brusch/Caisse formula, “Flor-Essence™,” and has marketed it for over forty-five years. This formula as well as the traditional Essiac formula may be found in health stores nationwide. Oftentimes the Essiac formula is sold under different names, such as Ojibwa tea. Directions for brewing the tea that accompany the Brusch/Caisse Flor-Essence™ proprietary blend of 8 herbs and the Ojibwa Tea company’s traditional 4 herb blend are essentially the same. Directions are also included in each dry herbal formula sold through health stores or via the internet. Rene Caisse at that time would not reveal her formula to the medical world because, as she said, they would not assure her the treatment would be used clinically in the treatment of cancer. She reasoned that, “if they did not know what I was using, they could not be in a position to condemn it. I have therefore kept my own counsel.” This, she felt, led to a decision by staff at the labs working with the Brusch Center to stop processing the Brusch/Caisse material. The American Medical Association had forbidden its members to refer patients to unknown remedies, patients stopped being referred, and work at the clinic ended. “Clinically, on patients suffering from pathologically proven cancer, it reduces pain and causes a recession in the growth. Patients gained weight and showed a great improvement in their general health. Their elimination improved considerably, and their appetite became whetted. Remarkably beneficial results were obtained even on those cases at the ‘end of the road’ where it proved to prolong life and the ‘quality’ of that life. Both Flor-Essence™ and Essiac™ as well as Ojibwa Tea, contain four principal herbs: Burdock root, Turkish rhubarb root, sheep sorrel, and slippery elm bark. The Brusch/Caisse Flor-Essence™ formula is proprietary, but the ingredients in order of descending magnitude are: burdock root, sheep sorrel herb, slippery elm bark, watercress herb, kelp, blessed thistle herb, red clover herb, and Turkish rhubarb root. Tamayo’s report describes the ingredients as follows. Burdock: This root contains a number of powerful antioxidants, several of which are more powerful than vitamin C. Burdock root extract from boiled water decreases mutations in cells that are exposed to toxic chemicals. Also, isoflavone derivatives in burdock root have been shown to induce apoptosis of tumor cells. It contains inulin, which stimulates growth of beneficial intestinal bacteria that in turn enhances immune activity and suppresses tumor cells. Sheep sorrel: Many folk cancer remedies have contained sheep sorrel. It has antioxidant and anticancer elements (anthraquinones) and it contains key minerals such as calcium, iron, magnesium, silicon, sulphur, copper, iodine, manganese, and zinc. Slippery elm bark: The inner bark is rich in mucilage, which forms a soothing gelatinous fiber when brewed. The bark also contains high concentrations of antioxidants. Many folk remedies for treating cancer (and urinary inflammations) use slippery elm bark, as it acts as a demulcent and emollient to the digestive system, soothing the passage of materials, including, as anecdote evidences, tumorous matter. Watercress herb: Watercress is a rich source of vitamins A and C and the minerals sulphur, iodine, calcium, and manganese. One of its by-products, isothiocyanates, has been found to inhibit tumor growth. It has been used for the prevention and treatment of lung and other cancers. Kelp: Kelp is full of minerals, especially iodine, but also calcium, potassium, magnesium, phosphorus, iron, and silicon. It has anti-inflammatory and demulcent action. It is well recognized for its ability to protect the body against radiation, and can reduce strontium-90 absorption from the intestinal tract by as much as 83 percent. Blessed thistle herb: This herb has anticancer and cytotoxic activity. It contains two of the same lignans found in burdock root (arctiin, arctigenin) that are shown to have antitumor activity. It also has antibacterial properties. Red clover contains large amounts of the phytoestrogen genistein, which is a recognized agent for cancer prevention and treatment. Red clover herb is the main ingredient in the effective Hoxsey cancer treatment. Turkish rhubarb root: This root has been used for centuries to improve digestion and loss of appetite. It is a safe and effective laxative as well. Its anti-cancer activity stems from emodin, or aloe-emodin, which has anti-tumor qualities. It is important to note that, though each of the ingredients in the formula has many qualities, including anticancer, herbalists have long recommended the blend. The reasoning is that the synergy of the ingredients, when brewed together, provides the overall effectiveness. For more in-depth information about the uses, chemical breakdown, planting and tending of the herbs, see Sheila Fraser Snow’s instructive book The Essence of Essiac. To read the full article, please see the May/June 2018 Issue (available in print or digital format). This article can also be found in our special collection on Preventing and Healing Cancer Naturally. We have compiled and organized in one place over 40 feature articles and research briefs about healing or preventing cancer naturally. Each full issue is downloadable for only $4. Janiger, Oscar, M.D. A Different Kind of Healing (J.P. Tarcher, Inc., 1993). Cairns, John, M.D., Townsend Letter for Doctors, May, 1993, #119, 911 Tyler St. Pt Townsend, WA 98368. Fraser and Allen, Homemaker’s Magazine, June/July/Aug. 1977.